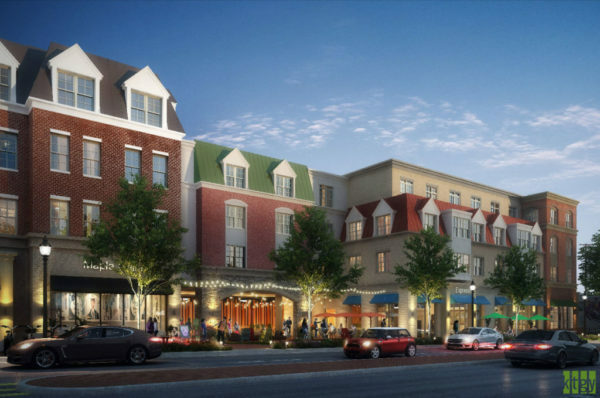 At a work session this Friday (Feb. 8), Vienna’s Board of Architectural Review (BAR) is going to take another crack at the Maple Avenue Commercial (MAC) zone design guidelines. The exact nature of the BAR’s review is a bit unclear. Details are scarce in the agenda, but the BAR is the second stage of a six-step process for new developments along Vienna’s main boulevard, following a staff review. In September, the Town Council voted to impose a moratorium on new developments filed under the MAC ordinance. The moratorium took effect on Sept. 30 and is scheduled to last until June 17. As part of the moratorium, the BAR was tasked with drawing up new guidelines for public review of projects. Scale and massing for new Maple Avenue developments has been the largest topic of debate in Vienna over the last year. The MAC ordinance, originally approved in 2014, was aimed at providing a new mechanism for developers to convert outdated and often vacant properties along Maple Avenue into mixed-use developments. But to make these projects cost-effective for developers, many are significantly larger in scale than the buildings they’re replacing.